Goodreads says, "Seventeen year-old Britta Flannery is at ease only in the woods with her dagger and bow. She spends her days tracking criminals alongside her father, the legendary bounty hunter for the King of Malam—that is, until her father is murdered. Now outcast and alone and having no rights to her father’s land or inheritance, she seeks refuge where she feels most safe: the Ever Woods. When Britta is caught poaching by the royal guard, instead of facing the noose she is offered a deal: her freedom in exchange for her father’s killer. However, it’s not so simple. The alleged killer is none other than Cohen McKay, her father’s former apprentice. The only friend she’s ever known. The boy she once loved who broke her heart. She must go on a dangerous quest in a world of warring kingdoms, mad kings, and dark magic to find the real killer. But Britta wields more power than she knows. And soon she will learn what has always made her different will make her a daunting and dangerous force." Britta Flannery's father has been killed in a brutal murder and the main suspect is Cohen, their close family friend and her father's apprentice. But Britta knows there's no way Cohen could have done it. Now Britta finds herself practically homeless and alone as Cohen has left and has yet to return. Britta, a skilled archer, is caught poaching by the king's men and in turn, is sent to the dungeon. Britta believes she is doomed until the king makes her an offer. She can be executed or help him track her father's alleged killer. They know that not only is Britta an expert hunter, she is also an accomplished tracker, thanks to her father. Britta is in a jam though. She knows Cohen didn't kill her father, but she has no choice to find him for the king. The one major problem? Britta still loves Cohen despite the fact that he left her high and dry. Her journey brings many ups and downs in Ever the Hunted. There's new lands, magic, dark secrets, and much more. Fans of fantasy and strong heroines will enjoy this new series. The thing I enjoyed most about Ever the Hunted was Britta. I love a strong heroine and she has it all. She's knowledgeable, determined, multi-faceted, and a bit stubborn. These are all things I love in a heroine, especially one that takes the readers on an epic adventure. Her family secrets proved to be very interesting and I loved Summerill's incorporation of magic as well as Britta's secret skills. Now the relationship in Ever the Hunted needed some work. While I liked Cohen well enough and knew there was more to him than just the king's murder suspect, I didn't necessarily feel the chemistry between Britta and Cohen. So, in this department, I expected a bit more. Also, parts of the plot of Ever the Hunted felt a bit derivative and familiar to me, much like many of the YA fantasies that I have recently read. While it didn't necessarily bring anything new to the table, I enjoyed Britta's journey and am curious as to what will happen in book two. 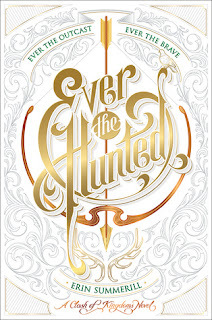 If you are looking for an entertaining new fantasy with a strong heroine, check out Ever the Hunted. While parts of it were a tad predictable, I liked the adventure and the character of Britta. A solid YA fantasy. While I am not sure if I'll be picking this up (the whole cutting back on reading YA thing), it does sound good. Glad that the main character is likable but too bad about the romance. It would be nice if a romance was left out of the equation sometime wouldn't it? As much as I love romance it doesn't always work especially if it feels kind of shoehorned into the plot or if the characters don't have chemistry as seems to be the case here. Great review! YES! It really would. I probably won't be continuing with the series, but it was entertaining overall. It really reminded me of some other fantasies I have read though. Thanks for visiting, Christina!